This Breakfast Fried Rice is delicious, low carb, and perfect for meal prep! Not to mention, it will be ready in under 20 minutes. It is a great recipe to add as a staple for breakfast, lunch, and dinner! Can I use this for meal prep? This is the perfect dish for meal prep! Fried Rice typically lasts for 5 to 7 days. So, simply divide into 5-7 different airtight containers to have each portion ready to go. This is a great meal to have at work and just warm up in the microwave. 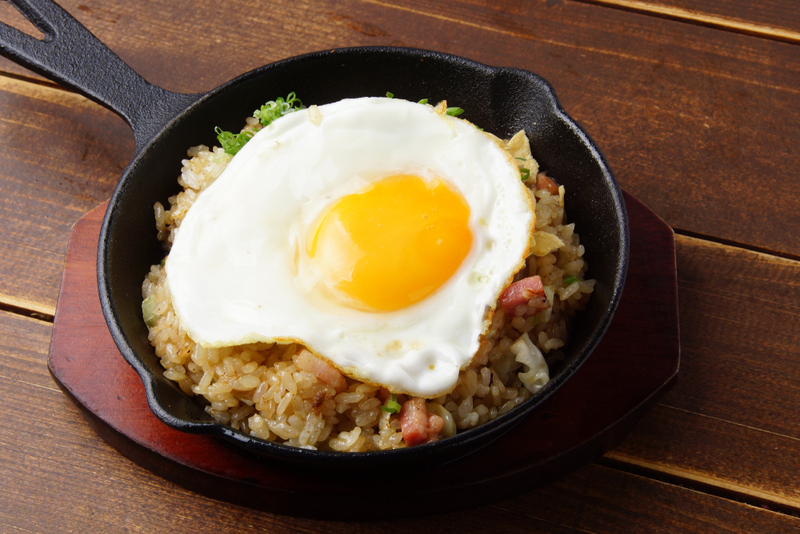 It is also perfect for a busy morning, just fry up an egg and warm up the rice! What can I add to this recipe? If you aren’t looking for a low carb option, try this recipe using minute rice or brown rice. In addition, we like adding peas (#6208), canadian bacon (#4047), and using soy sauce in place of coconut aminos. To add more flavor, try using a couple shakes of ground ginger (#1420). Finally, if you aren’t eating this for breakfast, add some diced chicken breasts (#7787) for a more filling dish. First, steam cauliflower rice in microwave according to the directions on our website, and place in a colander to drain & cool.